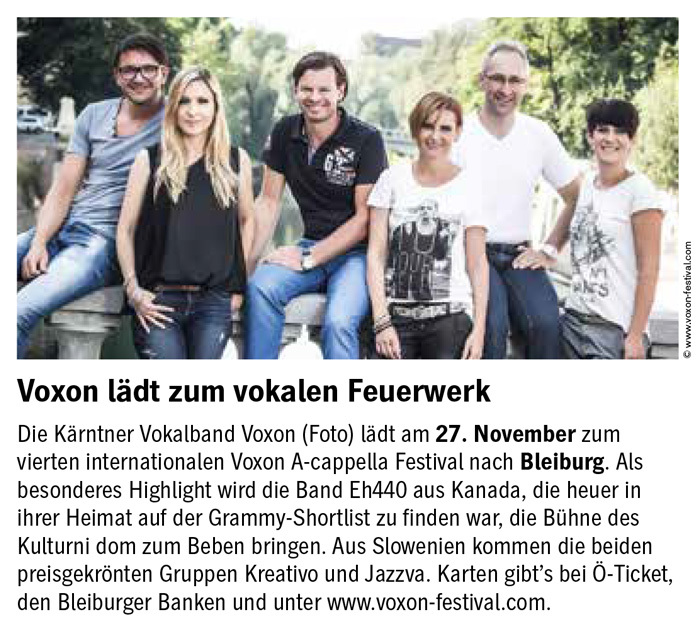 The Voxon festival was super well organized in the charming village of Bleiburg. 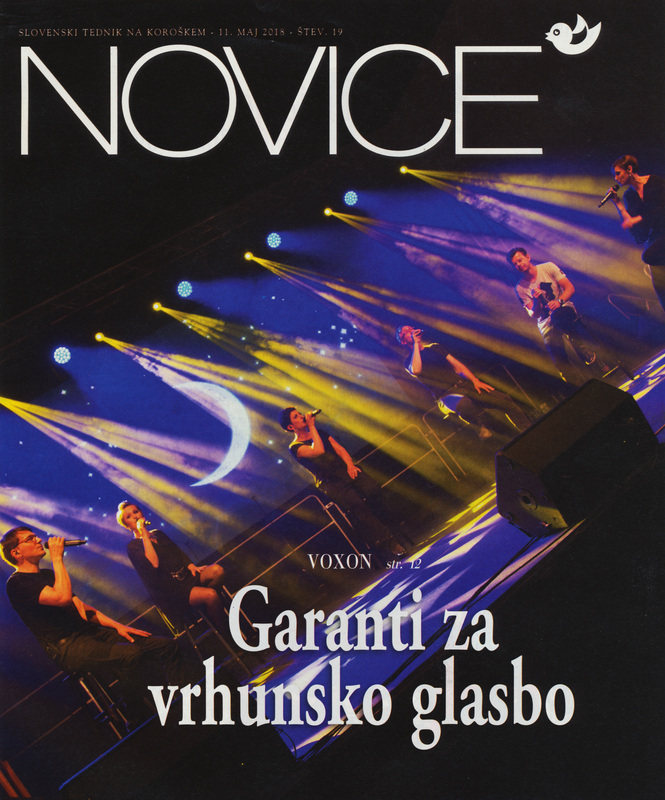 It was also a great pleasure and an inspiration to share stage with Voxon who delivers an a cappella show full of energy and musicality. The audience was enthusiastic in a very warm and listening manner. A dream stage for a vocal group! 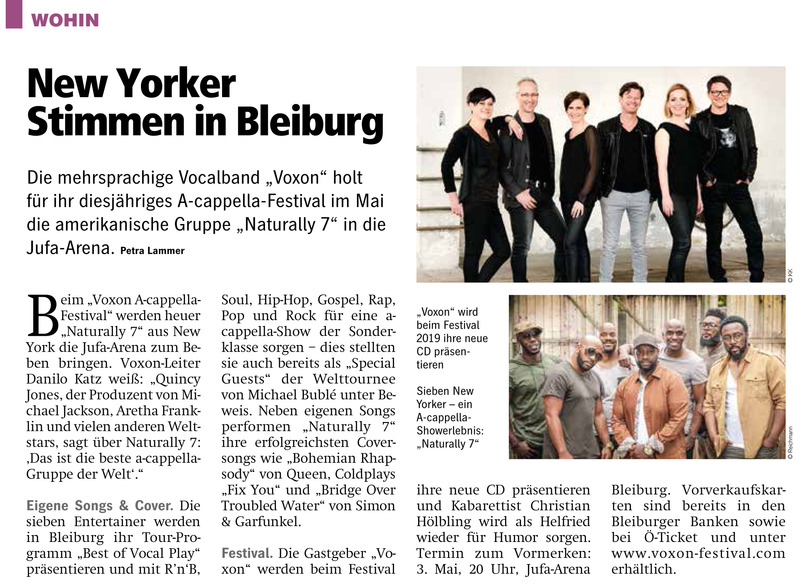 A long drive through the beautiful hills of Germany and Austria led The Exchange to the picturesque border-town of Bleiburg, Austria where they performed at the Voxon A-Cappella Festival. The event was hosted by local group Voxon, a collection of educators who double as fantastic singers and gracious hosts.What a change from the busy streets of Asia where we were no less than 3 days ago! The people in Bleiburg we met were so kind, and in less than a couple days we got a crash course in the town’s history, drove to Italy for some pizza, toured a castle hand-made by one local man, and had a raucous show! Oh yeah, the show! So big ups as well to our new friends in Anders, the charming German group responsible for an album of catchy originals and a well-put-together show! The whole night came to a humbling and exciting pinnacle when the crowd called for a 2nd encore. The Exchange sang one more number and spent the evening mingling with the locals for an unforgettable night. 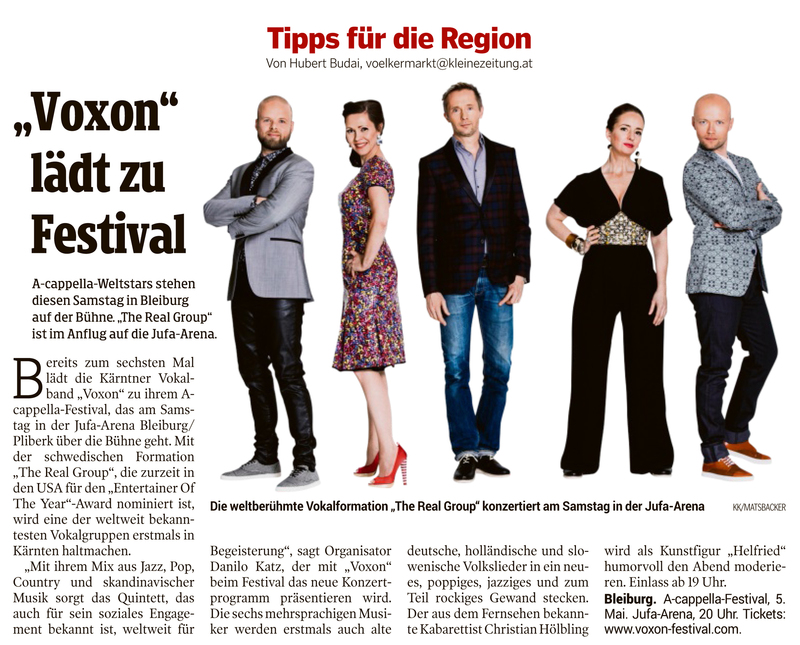 Thank you Bleiburg, Voxon, Anders, and everybody involved!!!! Ein vielstimmiges Festival. Ausverkauft war das „3. 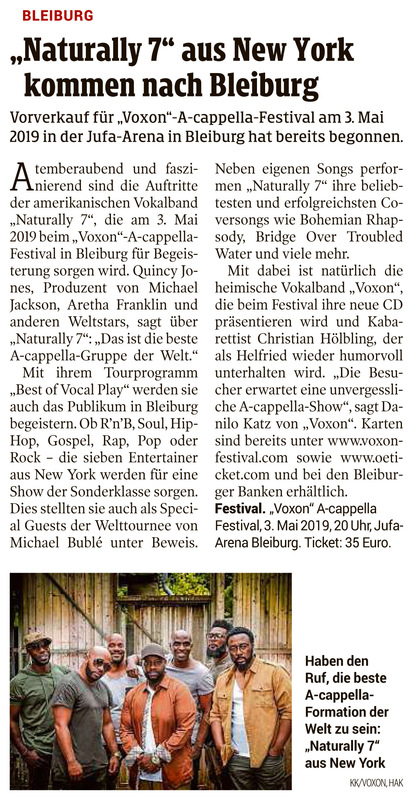 Voxon A-cappella-Festival“ im Kulturni dom in Bleiburg. 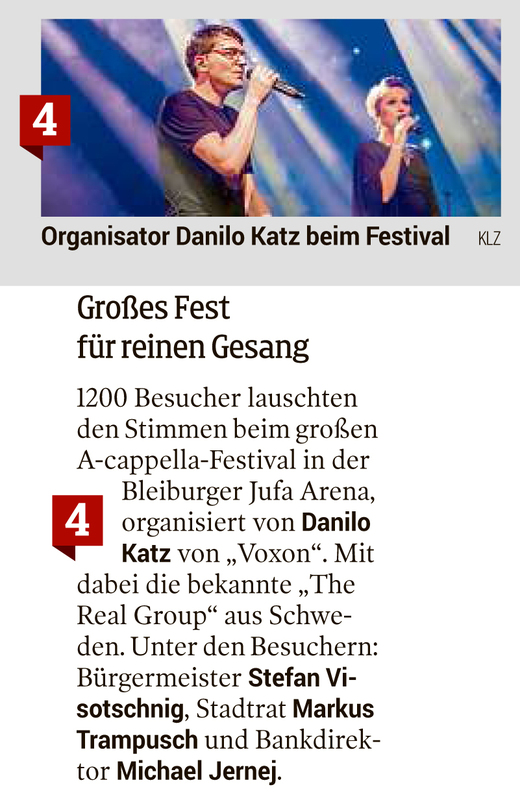 Die Gruppe „Voxon“ unter Leitung von Danilo Katz begeisterte Besucher aus ganz Kärnten, ebenso die A-cappella-Popstars „Cluster“ aus Italien und „A-kamela“ aus Slowenien. 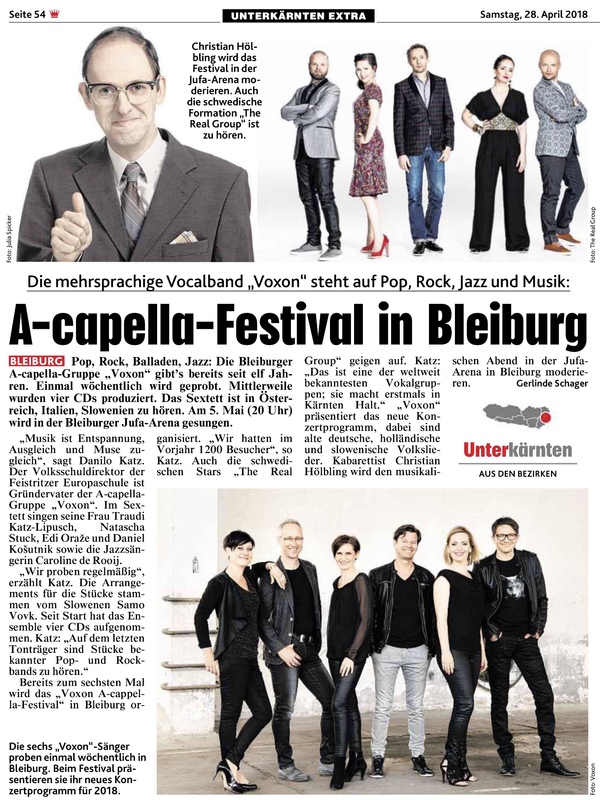 Auch heuer wartete wieder ein A-cappella-Feuerwerk auf die Besucher des Festivals im Kulturni dom in Bleiburg. Bei der Veranstaltung auf höchstem Niveau wirkten mit: Cluster aus Italien, A-Kamela aus Slowenien und Voxon – sechs Sängerinnen und Sänger aus Bleiburg/Pliberk. Im begeisterten Publikum im – bis auf den letzten Platz besetzten Kulturni dom auch viel Prominenz. 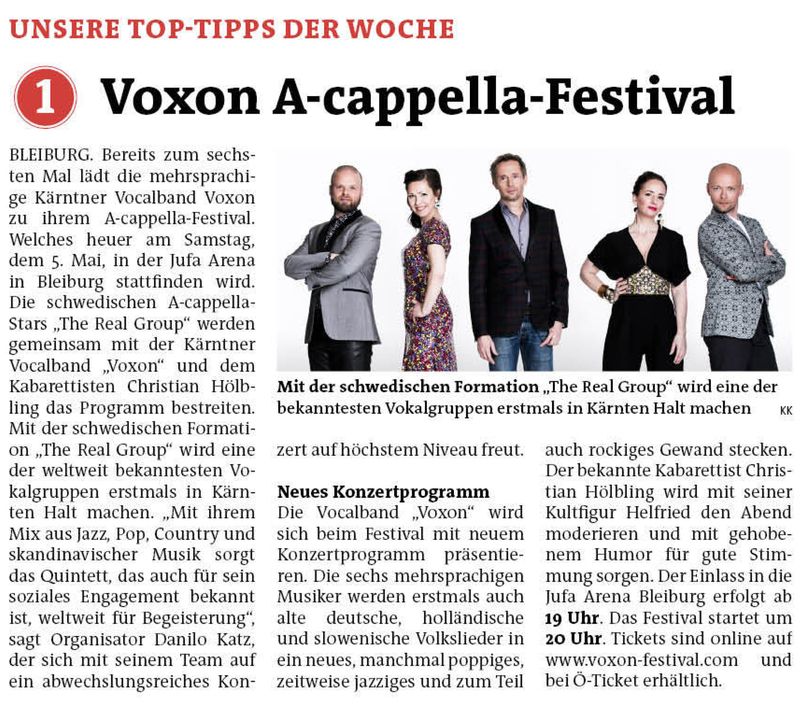 We had such an amazing time singing with Voxon and Anders at the Voxon A-cappella Festival in Bleiburg, Austria! Thank you so much for a wonderful show, and for your kindness and hospitality. We miss you already! 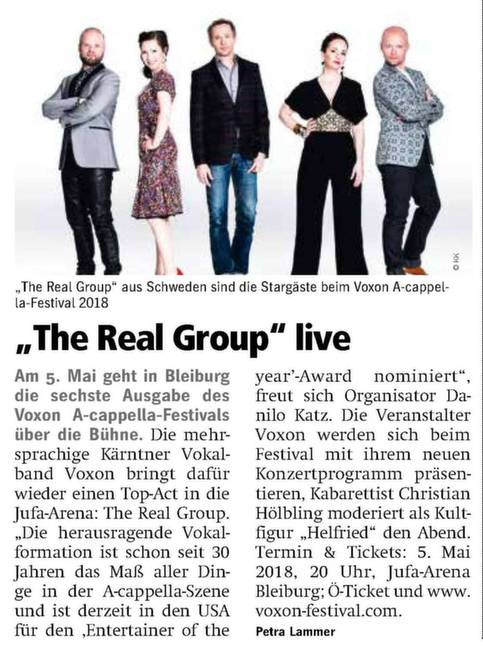 Das war ein sehr geiles Konzert in Bleiburg! To je bil zelo kul koncert v Pliberku! Ein toller Abend!!!! Gratulation und ich freue mich auf den nächsten! Izvrsten večer!!!! Čestitke in se že veselim naslednjega! Es war soooo toll danke für den schönen Abend! Bilo je takoooo super, hvala za ta lep večer! Toll was die von Voxon auf die Beine stellen! Alle Achtung! Super, kar Voxon postavi na noge! Vsa čast! Ohne Worte. Es war genial-alle-!!!!! Brez besed. Bilo je genialno-vsi -!!!! !